This is a enormous feat! Is there anyone interested? See message posted on facebook. "Hello all! I own the Indiana Jones museum that was featured on Breakfast Television some time back. 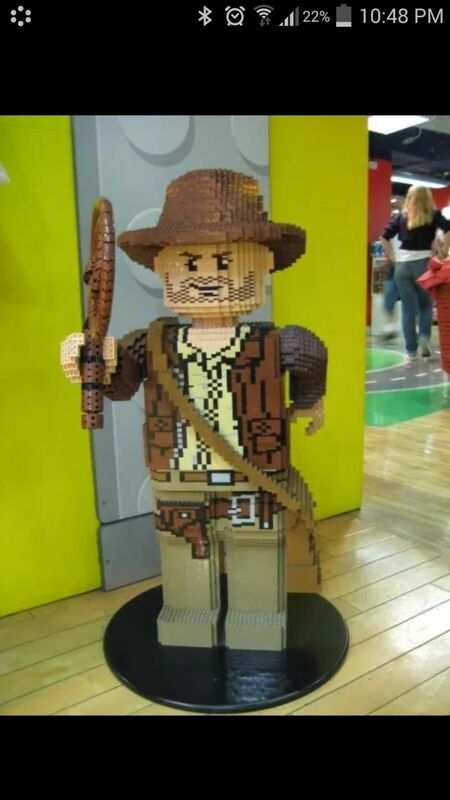 One of the items we wish we had is the Lego Indiana Jones large figure that Lego placed in select stores around the World when there were IJ sets in 2008-2010. Can anyone in the group build such a thing? We'd love to have it at the entrance to greet folks when they come through for the tour If anyone would like to accept our commission I can be reached at admin@throwmetheidol.com"
1) There's an Indiana Jones Museum? Where is this located? It is like the Star Trek Museum in Vulcan, AB? 2) That's a whole lot of bricks to get together to make it that large... good luck to anyone who would take it on. 2) Its too big of a task to amass the bricks needed to build something that large. It was an interesting inquiry.